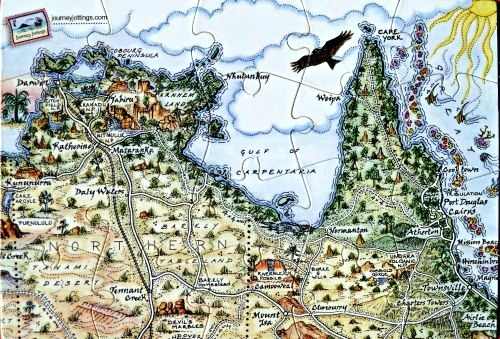 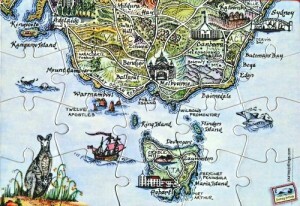 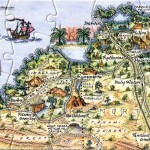 These jigsaws are each made up of 20 pieces, in a postcard size. 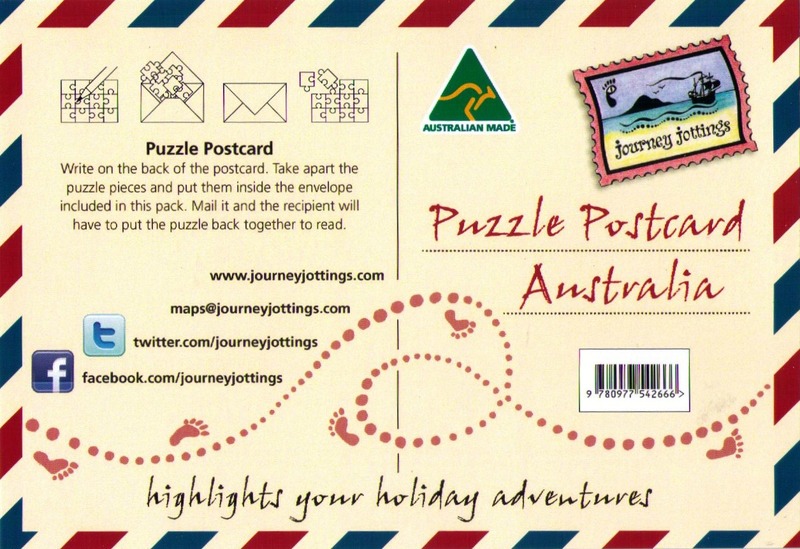 Write on the back of the puzzle postcard – Take apart and place the pieces in the included coloured Journey Jottings envelope. 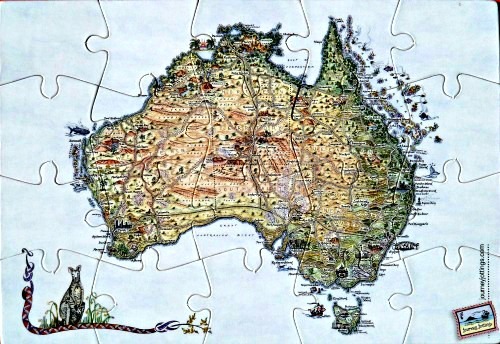 Mail it, and the recepient will have to put the puzzle back together to read your message. 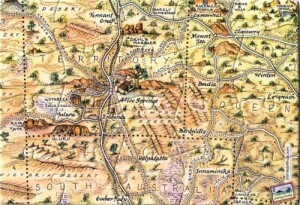 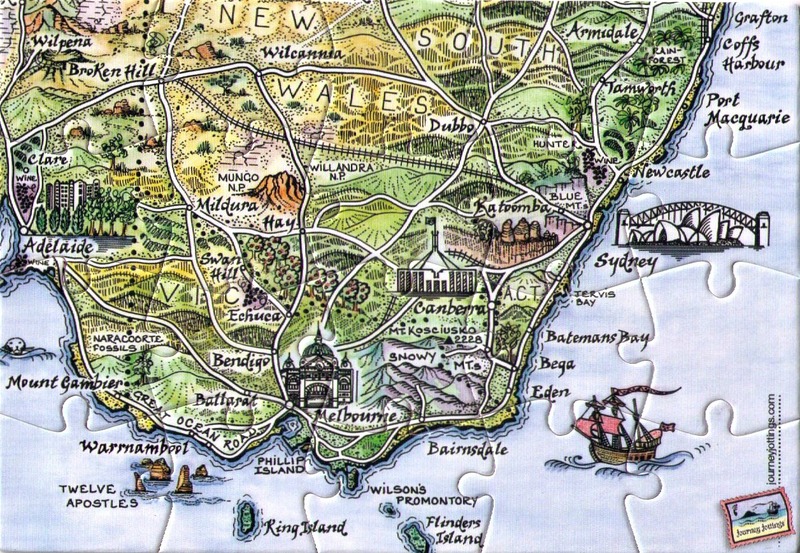 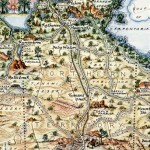 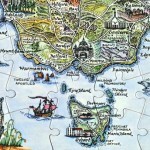 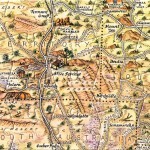 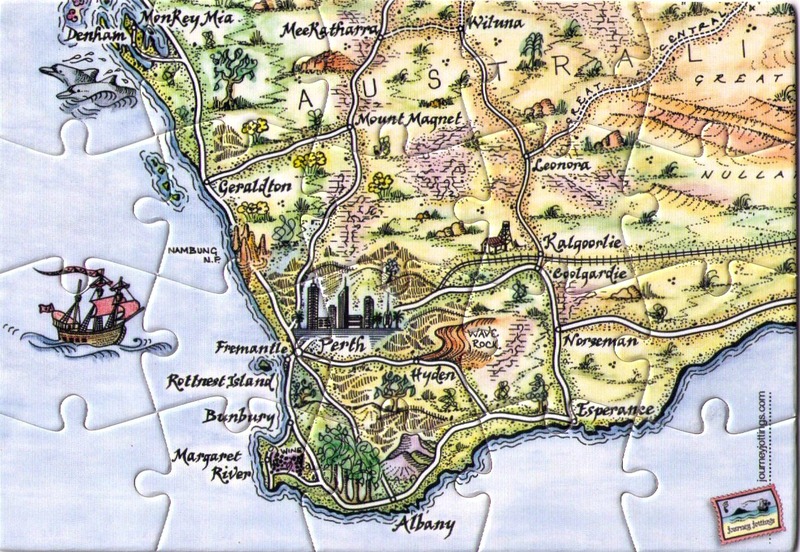 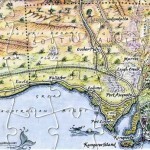 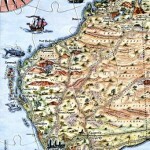 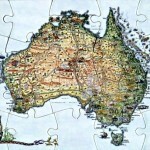 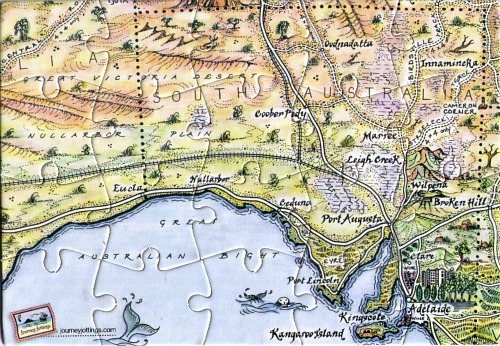 There are two puzzle postcards for the whole of Australia plus 14 regions, which are marked on the map below. 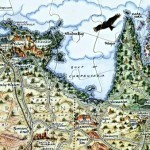 Click on the tinted region to see the image. 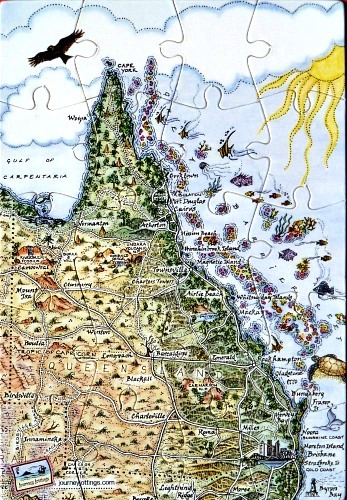 From the tip of Cape York down to the Tropic of Capricorn this puzzle postcard illustrates the Great Barrier Reef down the tropical Queensland coast. 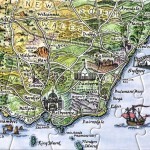 Write on the back of the jigsaw, take the puzzle to pieces, pop in the red envelope (printed with motif) and post – The recipient will have to make the puzzle to read your message. 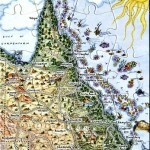 Travelling from Cairns to Darwin – This is the Puzzle Postcard you’ll need to taunt those back home with where you are! 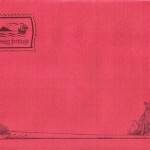 It comes with a red C6 envelope and and an Instruction sheet. 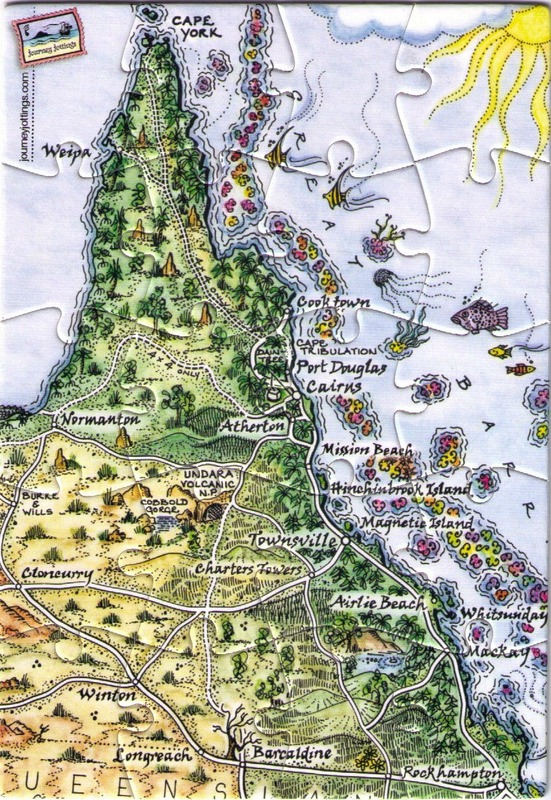 This Puzzle Postcard covers the whole of the Sunshine State of Queensland – from the tip of Cape York down the Great Barrier Reef to the state’s capital – Brisbane; and out to Mount Isa and Birdsville in the west. 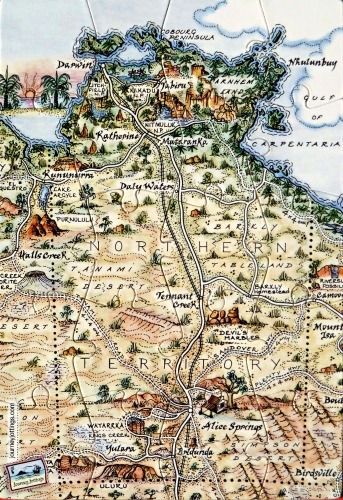 Rockhampton on the Tropic of Capricorn down the east coast of Australia to Sydney. 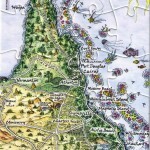 Shows Fraser Island, Byron Bay and Port Macquarie. 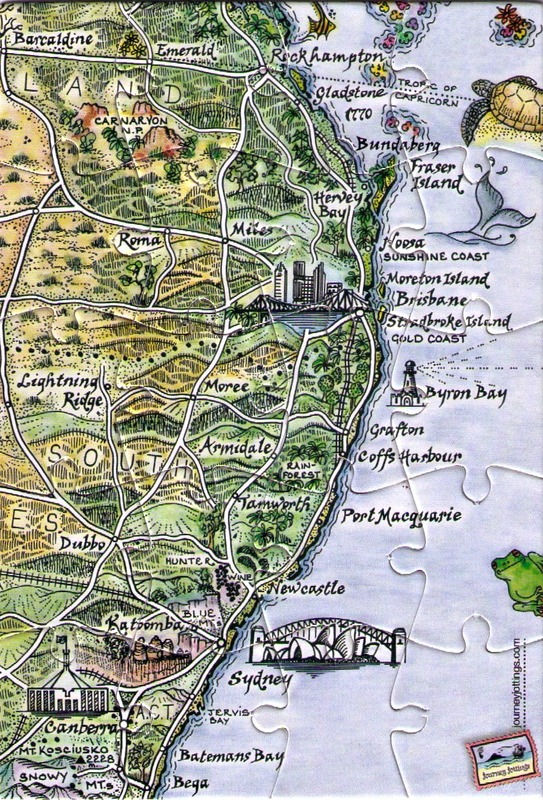 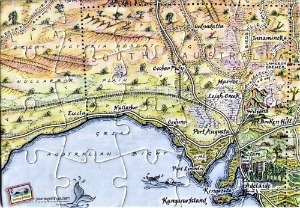 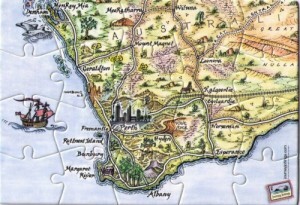 This Puzzle Postcard covers the South-East corner of Australia. 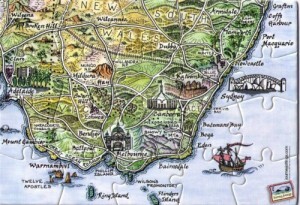 Sydney, around the coast to Melbourne and along the Great Ocean Road to Adelaide. 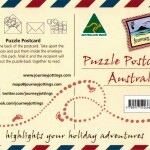 Each Puzzle Postcard is 160mm x 110mm and comes with a red coloured envelope, printed with a Journey Jottings motif. 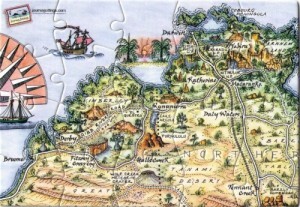 Write on the back of the postcard, take apart, place in the envelope and mail the pieces – The recipient will have to reconstruct the puzzle to read your message. 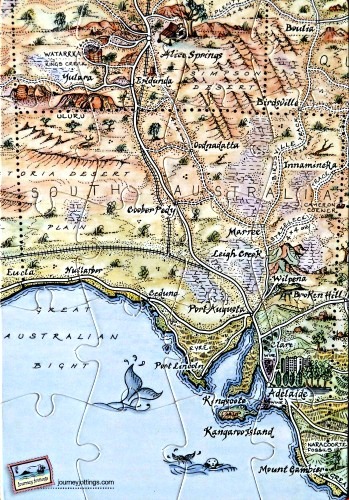 Darwin was where I first set foot in Australia and where I first heard the term “cartography” in a meaningful light. 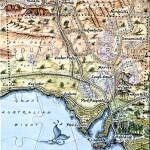 Darwin was also where the nucleus for my now signature Journal Map evolved more than 10 years ago! 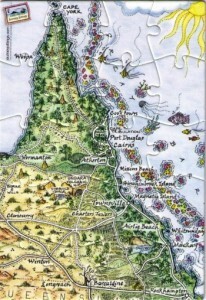 This 160mm x 110mm puzzle postcard map covers from Kakadu in the Top End, Darwin, Kununurra, Purnululu (Bungle Bungles) National Park, Fitzroy Crossing and across to the pearling town of Broome, west of the magnificent Kimberleys. 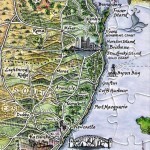 This puzzle postcard is 160mm x 110mm and comes with a red coloured envelope with a printed Journey Jottings motif. 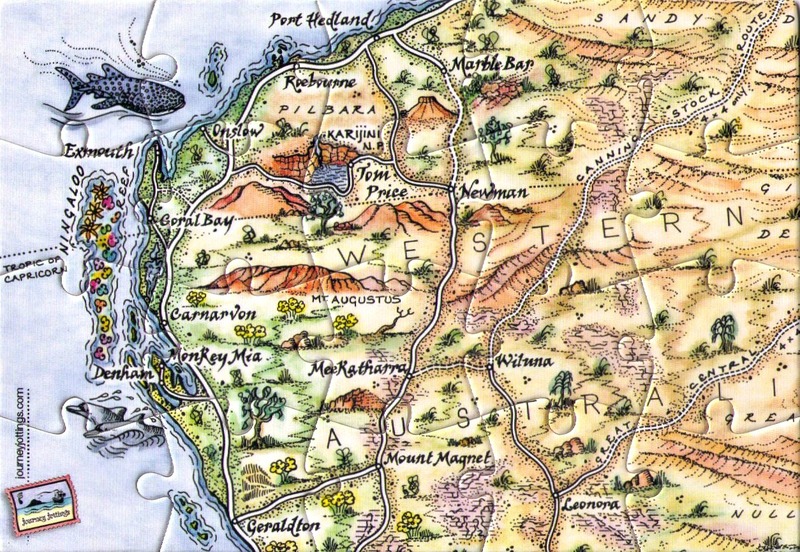 Covering the Ningaloo Reef, where you can swim with the whale sharks, and the rugged Pilbara where you can engulf yourself in the magnificent red gorges in Karajini National Park. 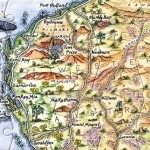 Western Australia is the most stunning State! 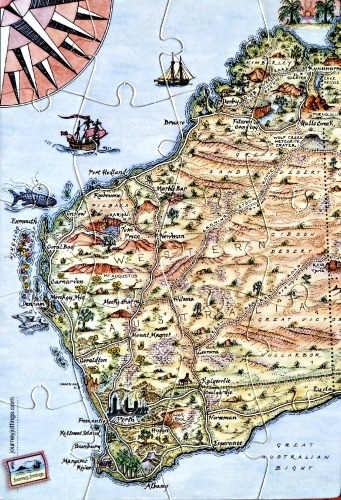 If you haven’t been, you need to go! 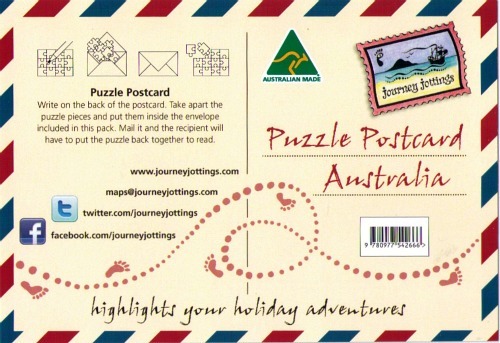 This Puzzle Postcard, like the others is 160mm x 110mm and comes with a red coloured envelope, printed with a Journey Jottings motif – And an instruction leaflet to guide you. 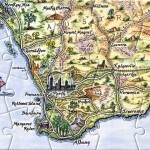 This Puzzle Postcard map covers South Australia and the Nullarbor Plain, where you can find the longest golf course in the world and also the longest stretch of dead-straight railway line… a 478 kilometre (297 mile) length! 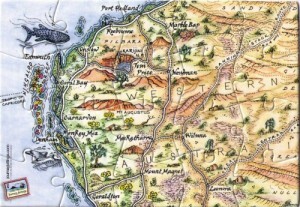 Wineries, desert, home of Mad Max, the stunning Kangaroo Island and the start of the Nullarbor Plain. 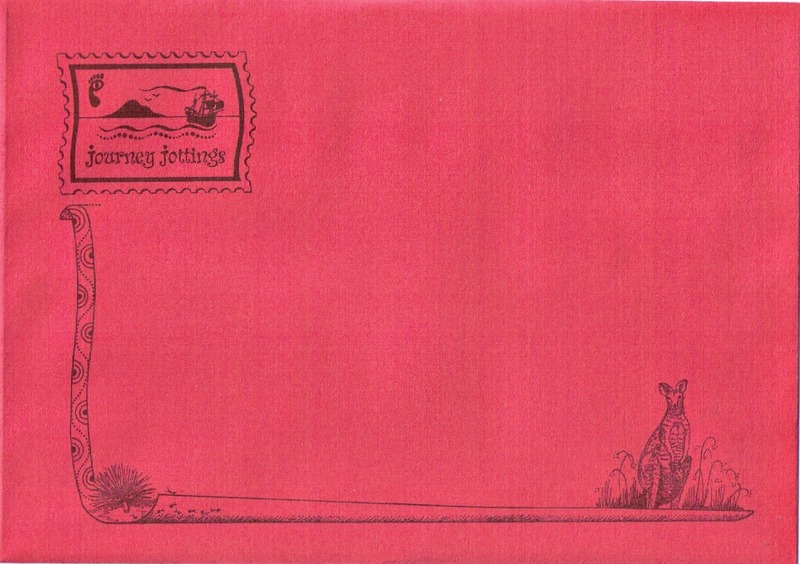 This Puzzle Postcard comes with a backing sheet, with instructions and of course a red envelope for posting to the lucky recipient. 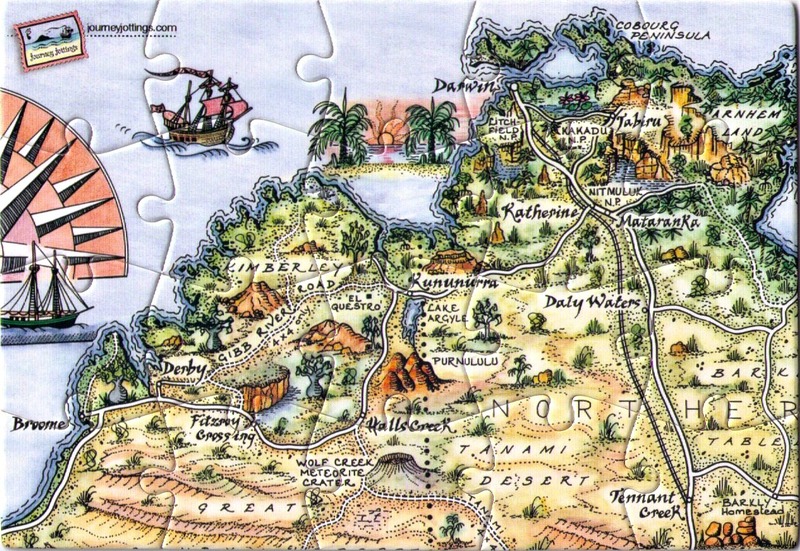 Write your message on the back of the puzzle, take the pieces apart and pop in the envelope to post to the recipient, who must work out how the puzzle goes back together again in order to read what you have said!